This new restaurant design strikes the perfect balance between modern and ethnic influences. When Tony Boon decided to renovate his Hollywood restaurant of 16 years, Pink Pepper, he turned to my firm; the result was a warm, appealing modern space with a strong Thai influence. The Pink Pepper restaurant in downtown Hollywood, California is a Thai restaurant with a fresh, new modern look of a European café with an Asian inspiration. The owner, Tony Boon, hired me to modernize the space by raising the ceilings and giving the restaurant a new palette of finishes that would reflect the Thai influence. The restaurant caters to local customers primarily in the entertainment business and was designed with a new energy to match and to appeal to a larger local audience. I showcased my unique, elegant perspective to renovating this Thai restaurant by using a combination of exposed concrete ceiling and floor contrasted with the luxurious finishes of Teak paneling and hand-finished Venetian plaster. 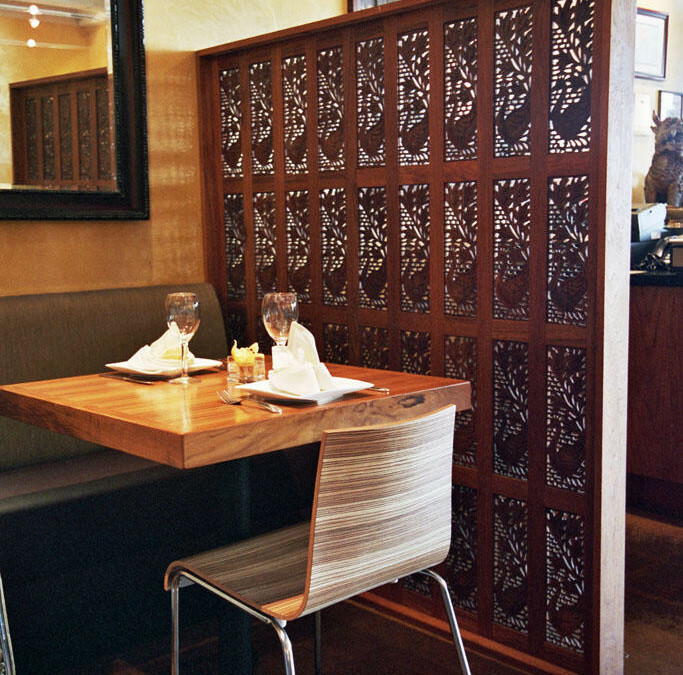 We used teak paneling and luxurious silk-like fabrics at the level where the customers sit and left the exposed concrete ceiling and steel ventilation ducts above for a hard-edged look. Covering the walls in a mustard-color Venetian plaster with a light rubbed-gold finish gives the room a comfortable glow and sets off the collection of Thai antiques that the owner has brought to the space. The restaurant’s new design contributes to the ongoing revitalization of downtown Hollywood as a destination and vibrant social center.